For years now, I have been reading aloud the Peter and the Starcatchers series with my sons. As the older son grew out of it, the next one would find his place next to me on the couch to listen, and now, it is on to the third son. (Of course, the older boys hover around the edges of the read aloud, furtively taking in the stories). The series is a fresh, fun take on Peter Pan, but told with humor and action by Dave Barry (yep, that Dave Barry) and Ridley Pearson. I won’t go into the entire series here (there are main novels and a few off-shoot novels), but there is plenty of magic, adventure, interesting villains and heroes, and all of the echoes from the old Peter Pan books that allow you to connect these storylines with the old. And for read-aloud, they are among the funnest to share with an audience (even an audience of one). Not long ago, my youngest son and I finished reading the latest in the series — The Bridge to Neverland — which transports the story from the early days of the story (which had been faithfully set in England around the turn of the century) to modern-day America. Here, a brother and a sister unwittingly discover the magical substance “starstuff,” are chased by the evil shapeshifting Ombra (who forms as a cloud of ravens in one of the strangest imagery I have seen), and use an invention of Albert Einstein to jump across parallel universes in order to call on Peter Pan to save the day. OK, so that sounds plenty strange as I write it. But it works. This year, I have an extremely strong reader in my class and I have turned her on to The Starcatchers books. She is devouring the series (which is no easy task, if you ever see the size of these books). It makes me happy to have put a story into someone’s hands that I have so enjoyed. You will enjoy them with your kids, too. Trust me. Find a place on your couch for a story to be told. I was a literacy professional development the other day and near the end of the session, one of my co-participants announced to our entire group that she had brought a box of free books (all ears perked up — these are teachers, remember) for all of us and she motioned towards a table towering with oversized books. The books had nothing to do with the PD but I guess she must have been part of some advocacy group. I ambled over there during a break and found dozens of shrink-wrapped Women: A Celebration of Strength. Of course, I grabbed one off the table and removed the shrink wrap. Inside, I discovered an amazing text that celebrates the struggles and successes of American women throughout our nation’s history, told through colorful images, timelines, artifacts from history, and even pop-up art. (That’s right, the pages have three-dimensional pop-up artwork like a picture book). In some ways, this book reminds of the -Ology books (like Monsterology or Dragonology, etc.) that featured various ways to get at a text and made the reading of the information an immersive experience. Later, at home, I spent about an hour going through Women: A Celebration of Strength and I was very impressed by the depth of topics and the writing. Thinking back, the educator who gave these out had mentioned someone’s name, saying you could get a box of ten of these books delivered to your school, for free. Did I write that name and information down? No! Now, I am kicking myself and wondering how to get that contact information so I can get some of these for my school and my wife’s school. I know I am going to put this book front and center in my classroom next week, and guide a few of my girls towards it. Maybe a few boys, too. When we took part in the National Day on Writing, my students used our iPod Touch devices for podcasting. It was our first exposure to the devices this year. I couldn’t help but listen in to their discussions and a few comments stayed with me. 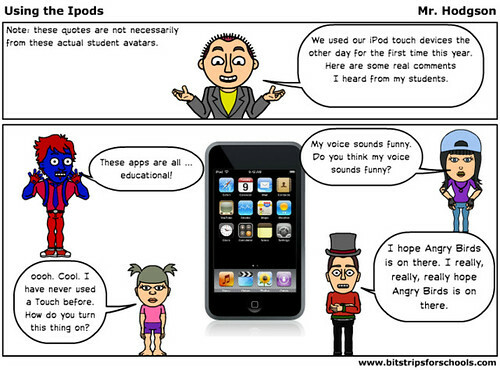 So, I made a comic, not just because I think the comments are sort of funny (they are, to me) but also because the comments give us some insight into their thinking around using mobile devices in the classroom. The Common Sense media group just released the results of a study of very young children (ages 0-8) and there are some interesting findings, including the increasing use of mobile devices and game consoles in young children’s lives. What is still in the air is whether this is good or bad, right? One of the various findings (all of which are very interesting, by the way) that stuck out for me is the continued Digital Divide concerns related to socio-economic factors in not only exposure to technology and media, but also knowledge of how to use it (thus, in my view, validating the ever-increasing importance of schools and teachers). They even reference an “App Gap” of who has access to mobile devices. That’s a new term for me. * Half (52%) of all children now have access to one of the newer mobile devices at home: either a smartphone (41%), a video iPod (21%), or an iPad or other tablet device (8%). * Half (51%) of all 0- to 8-year-olds have ever played a console video game, including 44% of 2- to 4-year-olds and 81% of 5- to 8-year-olds. Among those who have played console video games, the average age at first use was just under 4 years old (3 years and 11 months). Among 5- to 8-year-olds, 17% play console video games at least once a day, and another 36% play them at least once a week. * In a typical day, 47% of babies and toddlers ages 0 through 1 watch TV or DVDs, and those who do watch spend an average of nearly two hours (1:54) doing so. I continue to be torn between being an advocate for young people learning and using technology and media for their own reasons and exposing young people to these elements of technology and media. This tension comes to me in my role as parent as well as teacher. I keep an eye on trying to give kids the tools to “create” and become the composers with the technology, and not just passive users. That’s my lens. But studies like this indicate that too many parents of very young children are content to plop a kid in front of any screen and let them at it, no matter the age. That unsettles and worries me, to be honest. No screen should be a babysitter, and all of the initial research around brain development and technology seems to indicate something is going on with our brains when young people use technology. I am hoping to use parts of this study at a future Western Mass Writing Project event as a way to look at technology and pop culture and media saturation. Our Western Massachusetts Writing Project is in the midst of planning a Technology Conference in the early spring, with a focus on the ways that technology, pop culture and writing can come together in the classroom. And since the inquiry focus of our WMWP site this year is our state’s shift to its own Common Core curriculum, we’re going to work to make visible the connections with the new frameworks around technology. February 4, 2012, 9-12:30, snow date, February 11, 2012; Place to be determined. How many times have you wondered just how influential popular culture is in the lives of your students? This WMWP Technology Conference will examine and then use elements from popular culture as a means for connecting with the new Common Core Frameworks and for examining the influence in the lives of young people. The focus will be on Anchor Standards for use of digital media (#6 for Writing and #7 for Reading). Topics from social networking spaces to media advertising to music videos will be on the agenda, as well as discussions about how to tap into cultural influences in meaningful ways, including through various rhetorical lens. Participants will also work with technology to create examples of how to use pop culture for composition in the classroom. The workshop will be offered by members of the WMWP Technology Team. We’re working to bring in a local youth video group to give an opening keynote address, and we are planning breakout sessions around video analysis, social networking, video gaming and more. We intend to engage teachers on a variety of levels, from learning about these topics to doing these activities themselves. The theme of the day is inspired in part by Ernest Morrell’s keynote at the National Writing Project’s Urban Sites Conference, where he talked of the many connections/disco between the literacy in our students lives and how to tap into those experiences for meaningful work and play. I’m pretty excited about what we have planned. If you are in our neck of the woods, I hope you can come, too. After our recent whitewater rafting trip, my students jumped into Bitstrips to create a comic/advertisement for a rafting adventure. Really, it was a vocabulary exercise, as they had to incorporate a few of our weekly words into their comic. They had fun with it. Perhaps my expectations are a bit too much for interactive ebooks being developed for the various mobile devices in our lives. Or maybe I made the mistake of experiencing The Fantastic Flying Books of Mr. Morris Lessmore before really experiencing other ebooks and therefore, my bar has been set pretty high. My seven-year-old son and I sat down on our iPad the other day to “read” through Cosmo’s Day Off. It was nice. It had elements where he could manipulate different elements of the screen. You touch something and it does something. You know the deal. The art was colorful. The story, eh, just so-so. In fact, afterwards, I asked my son what the book was about and he gave me this pretty blank look, as if he were wondering “did we just read a story?” instead of experiencing an app. And that’s the difference, right? I want the technology and immersive reading elements to complement the story — in whatever form it is — and not supplant it. It’s like reading a picture book where the art is so wonderful and the writing so weak that you feel as if you are completely off balance. Cosmo’s Day Off is not quite like that, but it is missing something. Last spring, another teacher and I gathered up notes from our colleagues in grades 3-6 and began the work of creating a cohesive writing rubric for our school that could be adapted by teachers for various projects, with similar lines of focus. It was not easy, believe me. It turns out that many of us have different focuses, and the way we word things changes drastically from class to class, grade to grade. The rubric project is a push to try to have us all speaking the same language our expectations of our young writers, and also, to provide a line of consistency from one grade to another for all our students. And the two of us who were working to pull all of the various strands together felt a lot of pressure to represent our colleagues faithfully and not impose our ideas on the school.